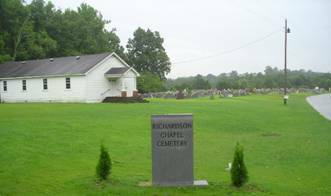 To reach the Richardson Chapel Cemetery, travel north from Killen, AL on US 43 to Greenhill, Alabama. Turn right onto County Road 47 (Old US 43) and go approximately 2.8 miles. Turn right (east) onto County Road 33 and go about 1.7 miles. Turn left onto County Road 39 and travel about 1.5 miles. Turn right onto County Road 619 and go about .6 mile. This is a dead-end road. 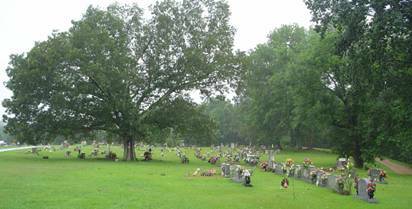 West Section: This section contains the oldest graves. 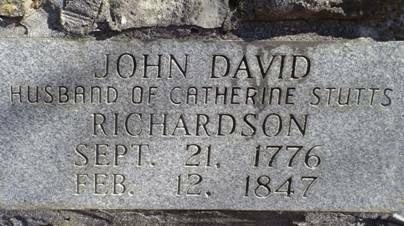 The oldest grave located by this surveyor is that of John David Richardson, having been born 21 Sep 1776. See pictures below. Also, there are two grave markers that are missing the top section. Barnett, Doris (Kasmeier); b. 04 Apr 1946, only date, wife of Waymon L.
Canerday, Mary J.; b. 02 Aug 1865, d. 12 Dec 1933, wife of J.W. Davis, Edwin; b. 26 Oct 1918, d. 08 Feb 1919, son of R.E. & A.V. Davis, Effie; b. 19 Feb 1910, d. 27 May 1918, daughter of W.E. & A.E. East, Sarah E.; b. 11 May 1872, d. 26 Mar 1913, wife of B.F.
Estes, Callie J.; b. 08 Oct 1885, d. 12 Aug 1913, wife of J.W. Green, Gentery; b. 08 Jun 1915, d. 30 May 1918, son of Robert E. & Lillie D.
Green, Lillie Dee; b. 23 Dec 1885, d. 12 Jan 1981, wife of Robert E.
Green, M.C. ; b. 07 Aug 1856, d. 08 Oct 1904, wife of William H.
Green, Marel; b. 11 Jul 1920, d. 03 May 1929, daughter of Robert E. & Lillie D.
Green, Olmon; b. 04 Apr 1919, d. 30 Mar 1925, son of R.R. & L.E. Green, Walton; b. 23 Oct 1907, d. 11 Jan 1911, son of Robert E. & Lillie D.
Green, Wynell; b. 15 Nov 1925, d. 04 Jun 1927, daughter of Robert E. & Lillie D.
Holtsford, Marcus R.; b. 20 Dec 1906, d. 19 Oct 1919, son of B.M. & B.J. Holtsford, Roy Lee; b. 11 Jun 1923, d. 06 Oct 1924, son of B.M. & B.J. Hutchins, Virgie (Gladney); b. 24 Feb 1917, d. 13 Mar 2006, wife of William S.
Johns, E.J. ; b. 1870, d. 1951, husband of Lizzie M.
Johns, Lizzie M.; b. 20 Feb 1864, d. 20 Mar 1939, wife of E.J. Jones, Henry L.; b. 23 May 1897, d. 13 Apr 1899, son of J.D. & L.G. Jones, Ida; b. 07 Jan 1895, d. 11 Apr 1895, daughter of J.D. & L.G. Jones, infant; b. 29 Nov 1918, d. 29 Nov 1918, infant of E.B. & M.L. Jones, infant; b. 23 Nov 1922, d. 31 Jan 1923, son of L.T. & L.C. Jones, infant; b. 27 Apr 1930, d. 27 Apr 1930, daughter of L.D. & G.R. Jones, Jenell; b. 23 Oct 1936, d. 23 Feb 1937, daughter of L.T. & L.C. Jones, Lou Creasy; b. 11 Nov 1854, no death date, wife of J.D. Jones, Robert E.; b. 23 Aug 1880, d. ?? Sep ???? Killen, D.M. ; b. Sep 1842, d. 02 Jul 1917, husband of Hannah M.
Killen, Henry A.; b. 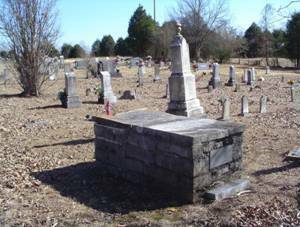 31 Jan 1837, d. 03 Mar 1913, husband of Sallie A.
Killen, infant; b. 14 Jul 1916, d. 14 Jul 1916, daughter of W.E. & B.B. Killen, infant; b. 15 Sep 1924, d. 15 Sep 1924, infant of L.D. & V.L. Killen, infant; b. 14 May 1930, d. 14 May 1930, son of J.J. & N.L. Killen, infant; b. 09 Sep 1943, d. 09 Sep 1943, daughter of L.D. & V.L. Killen, infant; b. 05 Nov 1947, d. 05 Nov 1947, son of H.M. & W.M. Killen, infant; b. 31 Mar 1949, d. 03 Apr 1949, son of L.D. & V.L. Killen, Mary E.; b. 21 May 1857, d. 28 Aug 1887, wife of R.T.
Killen, Rosa A.; b. 09 May 1872, d. 18 Oct 1931, wife of W.T. Killen, Sallie A.; b. 13 Apr 1848, d. 21 Mar 1921, wife of Henry A.
Killen, W.T. ; b. 30 Apr 1871, d. 21 Mar 1941, husband of Rosa A.
Lemay, Ida O.; b. 23 Aug 1888, d. 08 Dec 1914, wife of J.O. Mashburn, Lenice; b. 13 May 1912, d. 23 Jun 1981, wife of O.S. Michael, infant; b. 02 Feb 1902, d. 02 Feb 1902, infant of G.F. & E.A. Morrison, Elizabeth; b. 21 Jul 1924, d. 21 Sep 1924, daughter of C.O. & D.C.
Pettus, Elbridge; b. 05 Dec 1926, d. 11 Oct 1926, son of W.H. & M.P. Phillips, Mary E.; b. 17 Jul 1855, d. 14 Aug 1914, wife of J.F. Putnam, Robert L.; b. 27 Sep 1900, d. 10 Oct 1901, son of W.R. & D.L. Putnam, Vernie; b. 31 Jan 1902, d. 07 Feb 1903, daughter of W.R. & D.L. Richardson, Annie R.; b. 14 Aug 1880, d. 07 Mar 1892, daughter of J.D. & Mary D.
Richardson, Dock; b. 13 Jan 1884, d. 06 May 1890, son of J.D. & Mary D.
Richardson, John D.; b. 22 Feb 1859, d. 03 May 1929, husband of Mary D.
Richardson, Mary D.; b. 04 Jul 1861, d. 30 Dec 1921, wife of John D.
Richardson, Mary Sue; no dates, infant of R.D. & F.E. Richardson, Naomi; no dates, infant of R.D. & F.E. Richardson, Turner; b. 18 Mar 1885, d. 23 Jul 1894, son of G.T. & M.J.
Robinson, John W.; b. 21 Aug 1849, d. 25 Apr 1912, husband of Sarah O.
Robinson, Sarah O.; b. 23 May 1858, d. 19 Jan 1923, wife of John W.
Sharp, Annie Lou; b. 04 Apr 1906, d. 27 Feb 1931, wife of O.L. Springer, Amanda Jane; b. 28 Nov 1866, d. 30 Oct 1940, wife of Rufus C.
Springer, Cora; b. 03 Apr 1867, d. 09 Sep 1920, wife of Robert L.
Springer, infant; b. 22 Jul 1905, d. 22 Jul 1905, infant of R.T. & M.L. Springer, J.J.; b. 27 Nov 1855, d. 23 Apr 1934, husband of M.E. Springer, M.E. ; b. 14 Mar 1853, d. 27 Sep 1925, wife of J.J.
Springer, Mary M. (White); b. 29 Mar 1906, d. 28 Jun 1966, wife of Henry L.
Springer, Rozy Lee; b. 24 Sep 1881, d. 08 Nov 1881, daughter of W.J. & M.B. Stanford, O.D. ; b. 02 Feb 1937, d. 02 Feb 1937, son of O.D. & A.M.
Thigpen, Sallie (Posey); b. 16 Dec 1863, d. 22 Sep 1928, wife of J.C.
Thornton, Thomas H. Jr.; b. 15 Oct 1928, d. 24 Jun 1932, son of T.H. & E.M.
Wilcoxson, infants; b. 15 Sep 1908, d. 15 Sep 1908, twin sons of D.T. & M.E. Wilcoxson, William Jesse; b. 13 Nov 1826, d. 28 Apr 1904, husband of D.H.
Wilcoxson, William N.; b. 02 Feb 1880, d. 10 Feb 1880, son of J.M. & R.A.
Williams, Caroline; b. 26 Apr 1853, d. 11 Feb 1924, wife of John B.
Wright, Delburt; b. 04 Feb 1914, d. 18 Jun 1918, son of W.J. & M. U.